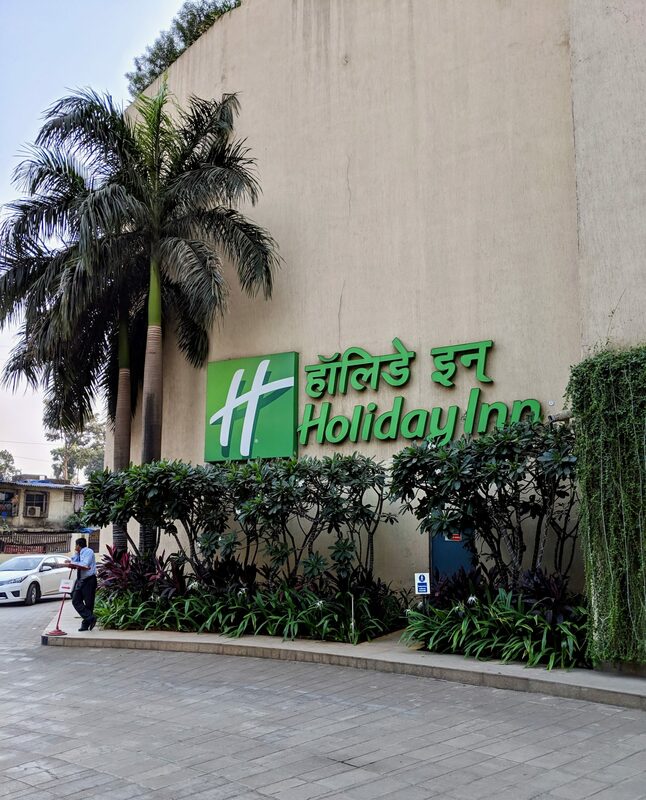 I was planning to travel to Mumbai and while deciding where to stay Holiday Inn came up in the options. I had already stayed at Holiday Inn at Phuket and had loved my experience so without a doubt I finalized it. 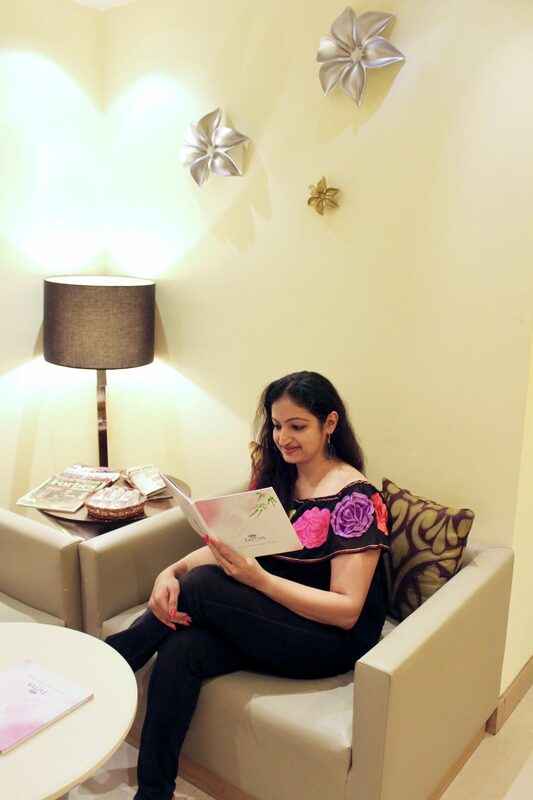 Stepping in at Holiday Inn Mumbai International Airport brought back the lovely memories of my time at Holiday Inn Phuket! 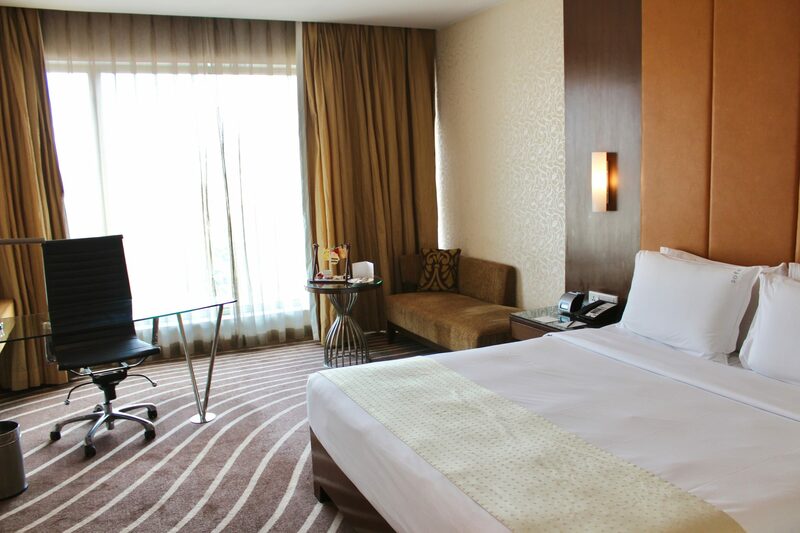 Located near the International Airport, the hotel welcomes you in just a few minutes of landing. The beautiful lobby consists of a lovely painting at the centre which I would say is a great backdrop in itself. The colourful painting added vibrancy to the otherwise calm and neutral interiors. 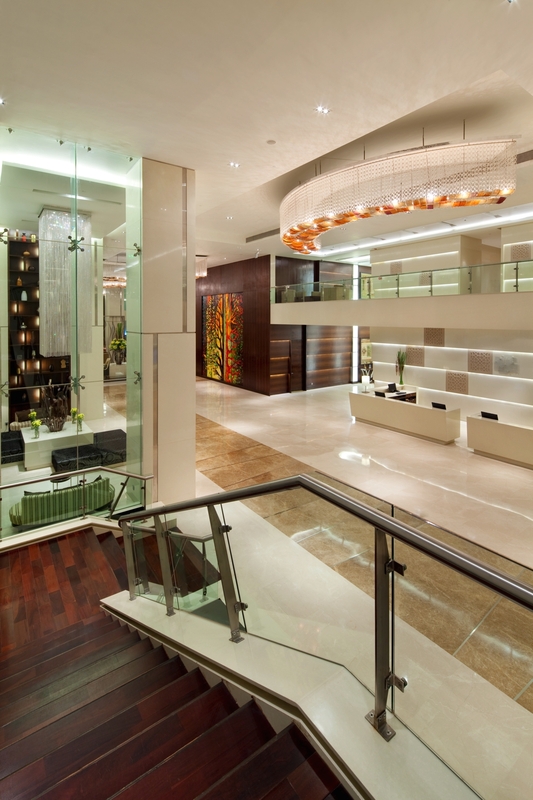 Towards the right side of the lobby was the reception where friendly guest relation executives ensure the check-in is done swiftly so that you can be taken to the lovely room. While on the left side of the lobby was the cafe, bar as well as the restaurant. The whole arena looked grand and majestic with the right colour combinations and aesthetic touch. 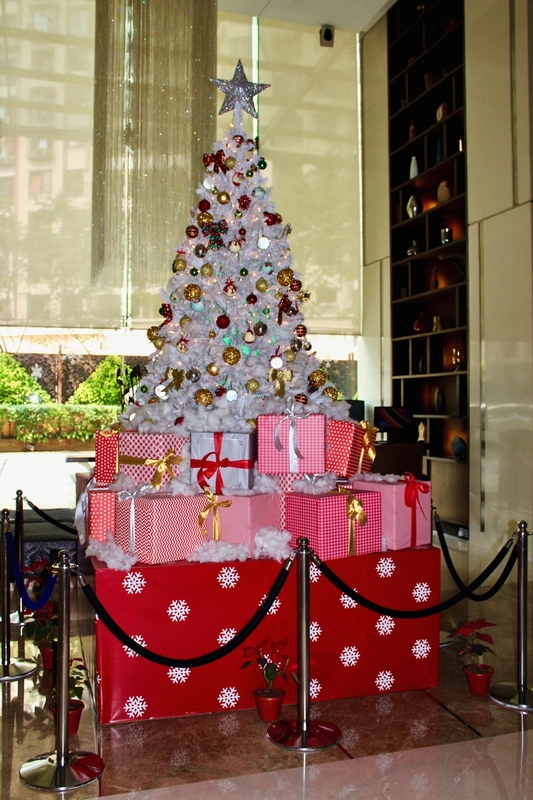 We were at the hotel in the month of December which is the month of Christmas and the hotel was beautifully decorated with a big Christmas tree and ginger house. 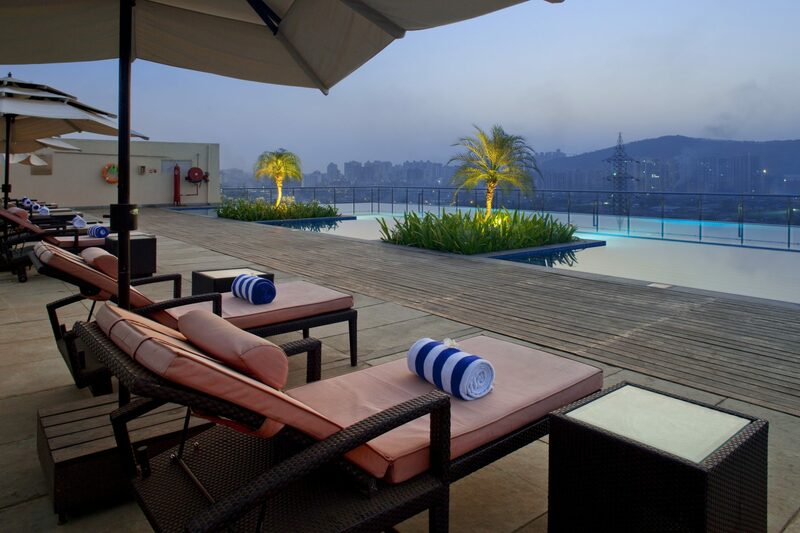 Since the hotel is located near Mumbai airport, one can see planes jet off from the runway and the Hiranandani Garden district’s skyscraper skyline from the hotel’s infinity rooftop swimming pool. The hotel is equipped with 245 modern and chic rooms with modern amenities like a smart workspace, premium bedding with your choice of pillows, invigorating bath experience, premium internet access, iPod docking station with FM radio & alarm clock. 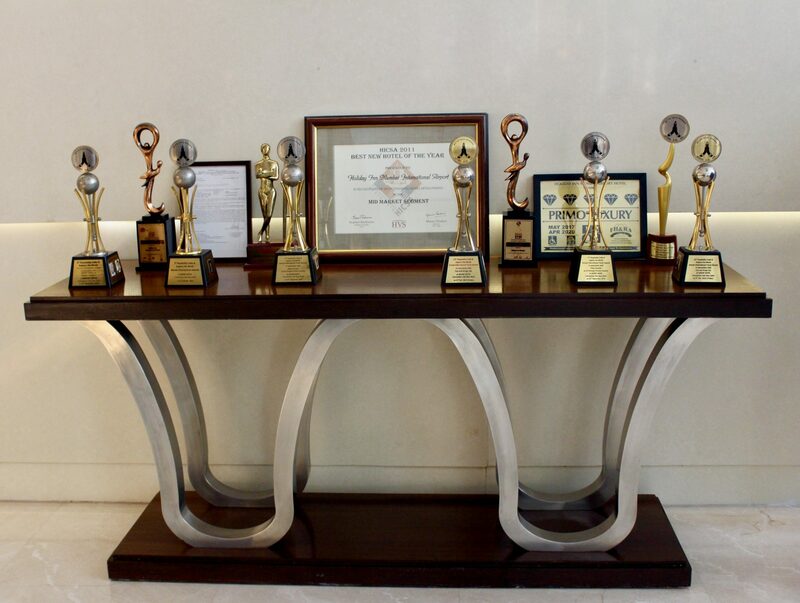 There are a variety of rooms catering to different requirements from Superior Rooms (180) to Studio Suite (12) to Deluxe Rooms (7) to Executive Rooms (46). The staff took us to our room which was absolutely gorgeous. The room’s highlight being the natural light it received through the beautiful windowpane which made the whole room look even more appealing. Well furnished with neutral colours to calm you, the room was big enough according to Mumbai standards and had all amenities like King size bed (there is a choice between twin size bed and king size bed in superior category) plus a nice comfortable couch to sit and adore the Mumbai skyline. My first task in the room was to sit on the comfortable couch and have the edible goodies! Oh did I miss mentioning that? The room had some edible goodies waiting for us. 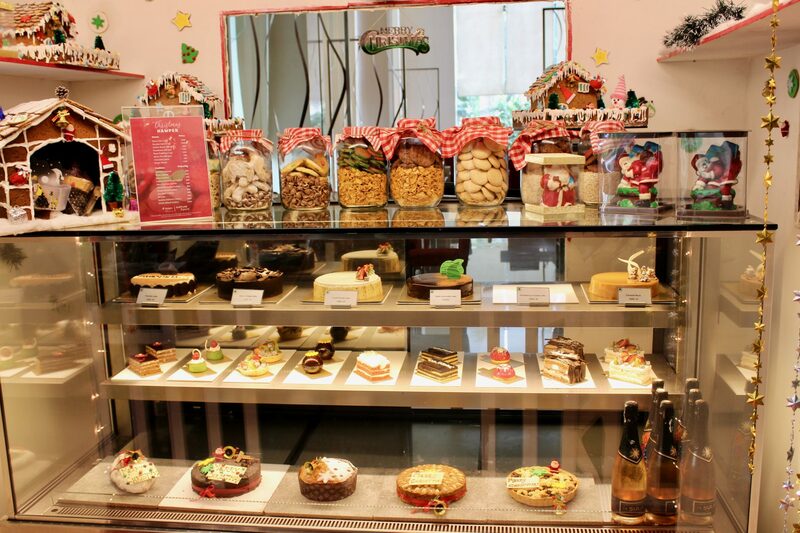 It was like Christmas came a few days early and we loved indulging in the wonderful sweet treats and reading the personalized handwritten notes. 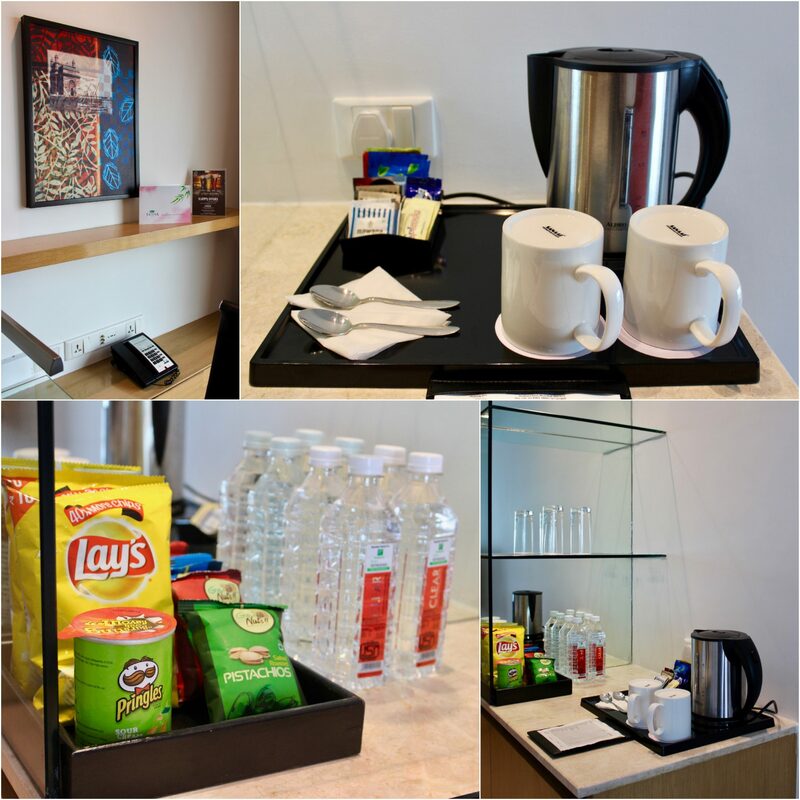 Coming to the other amenities, it included tea/coffee, electric kettle, drinking water and a mini bar. 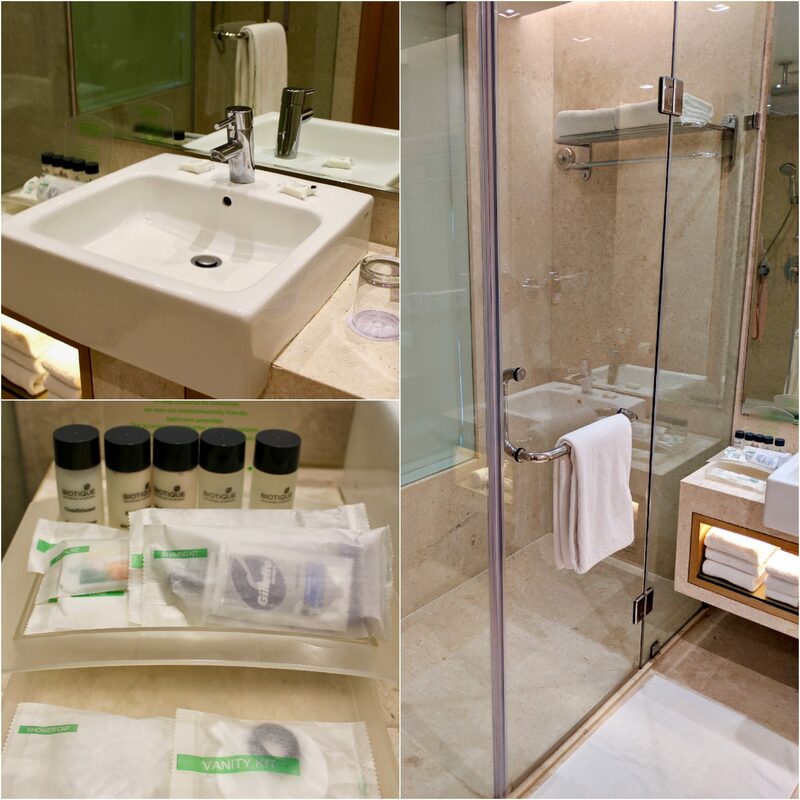 The bathroom was well equipped with toiletries like shampoo, conditioner, body lotion from one of my favourite brands Biotique along with other toiletries for comfortable stay. 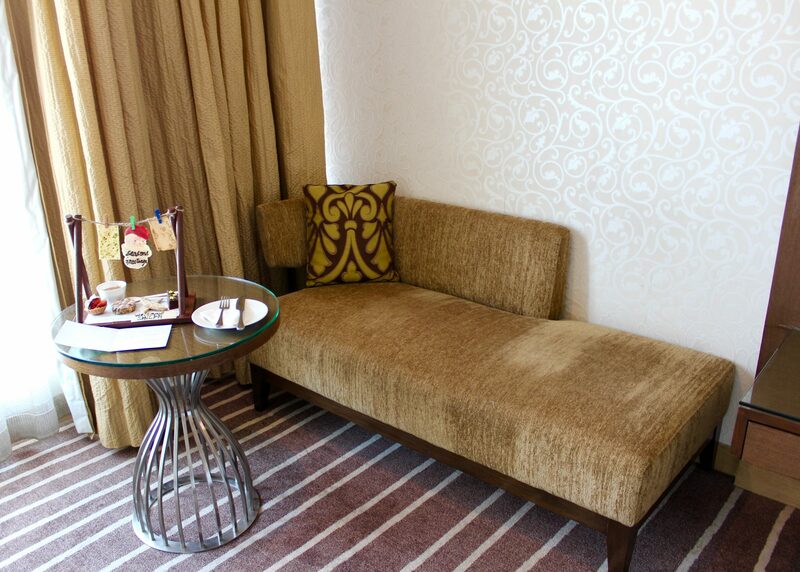 The sophisticated guest room comes with an iPod docking station and a 32-inch flat-screen TV. 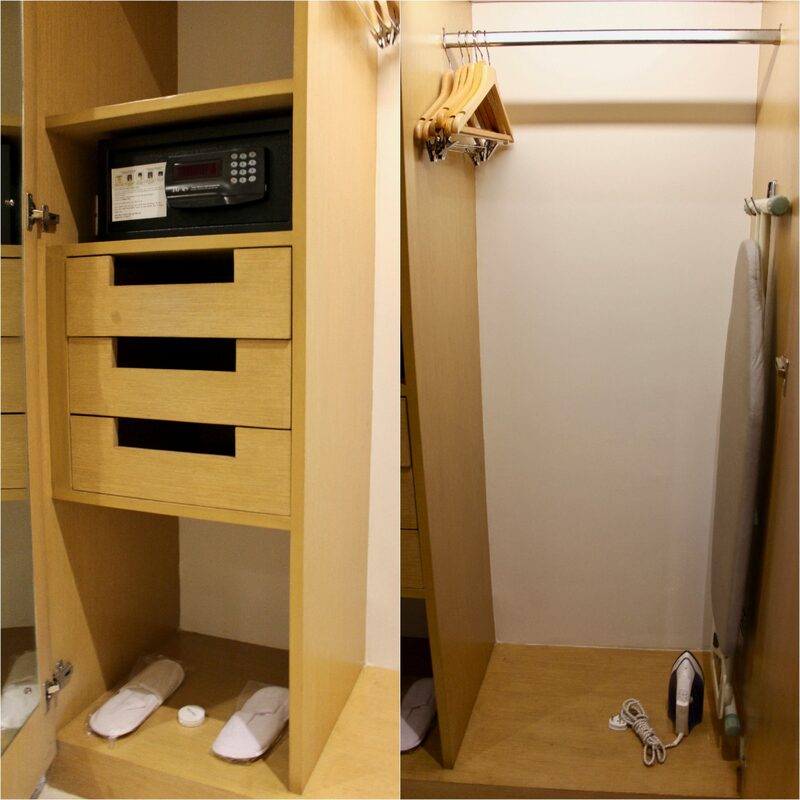 Not to be missed is the wardrobe with the full length mirror. Yayyyy!! 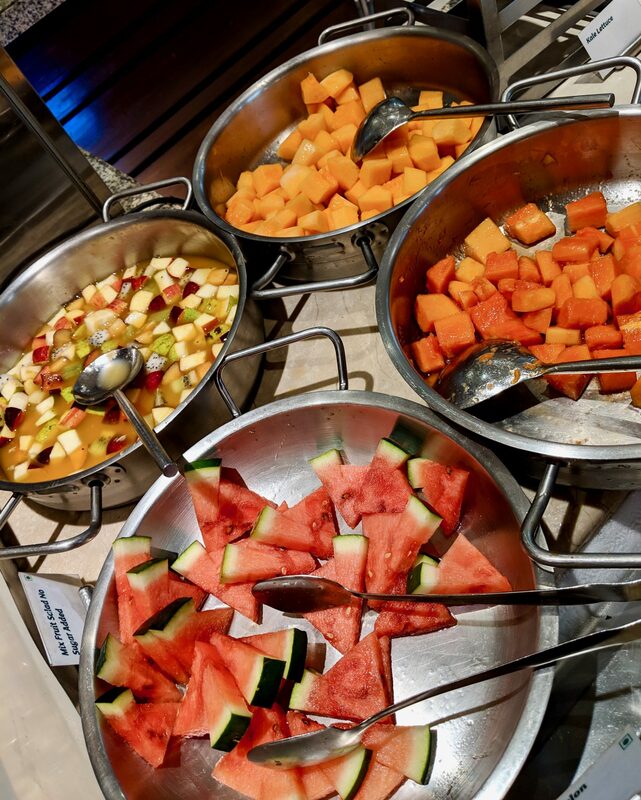 When we entered the restaurant we saw a well laid out buffet and the open kitchen where chefs were busy whipping up the best meals, serving and making guests happy. White and brown dominating the interiors, the restaurant looked beautiful with grand chandeliers on the ceiling mesmerizing the whole place with its aura. When we headed for Breakfast, the first thing we spotted was the Live Tea counter. 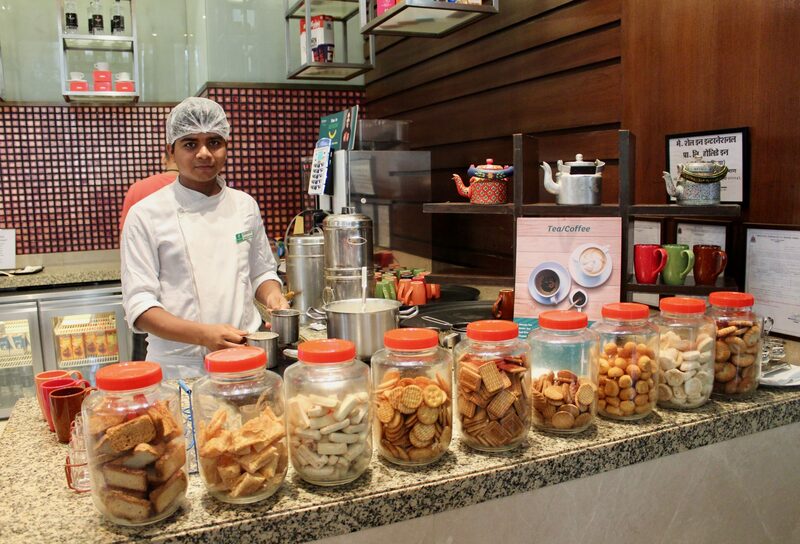 Tea was being made fresh infront of our eyes and also on the live counter were a wide range of cookies in different canisters. Don’t think I have seen such a counter anywhere else. The wide choice included Masala Tea, Green Tea, Earl grey, Chamomile, Assam, Darjeeling, English Breakfast, Filter Coffee, Cappuccino, Espresso, Decaffeinated Coffee, Latte, Black Coffee and Hot Chocolate. Just loved the concept! Breakfast spread was a lavish spread from soups to salads to a lot of other delicacies. 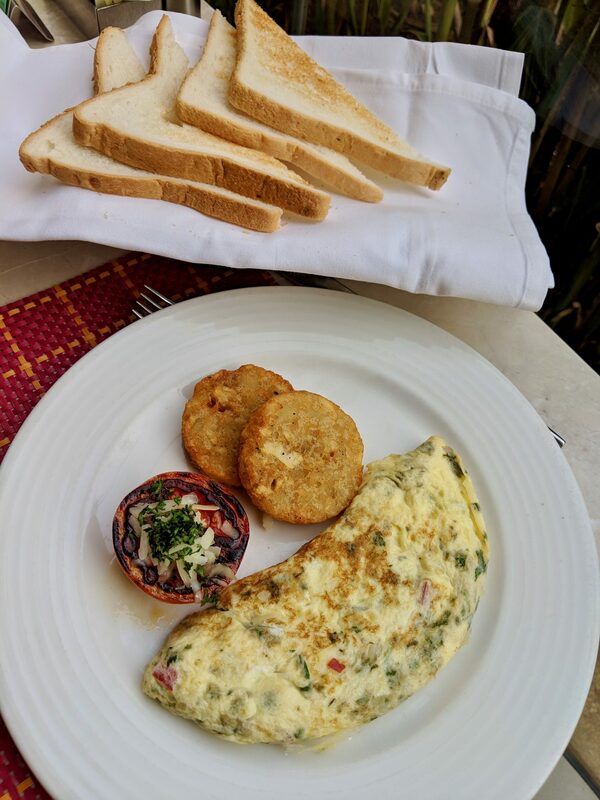 One of my favourite part of a hotel breakfast is Omelettes and Dosas which are made live and presented piping hot. 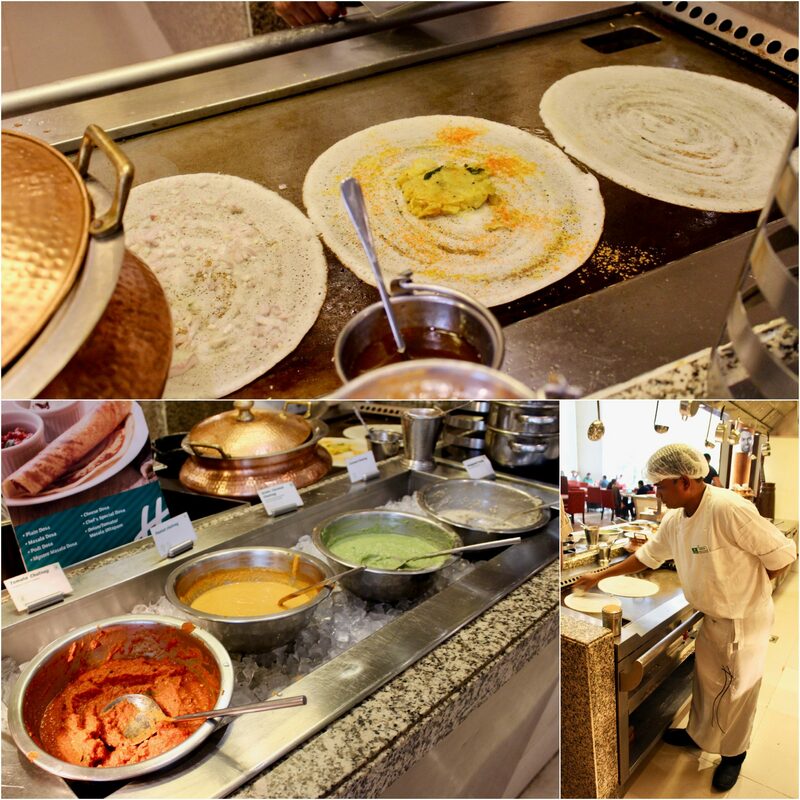 To our delight there was a wide range of Dosas like Plain/Masala/Podi/Mysore Masala/Cheese/Chef Special and also Uttapam with a choice of toppings like Onion/Tomato/Masala. 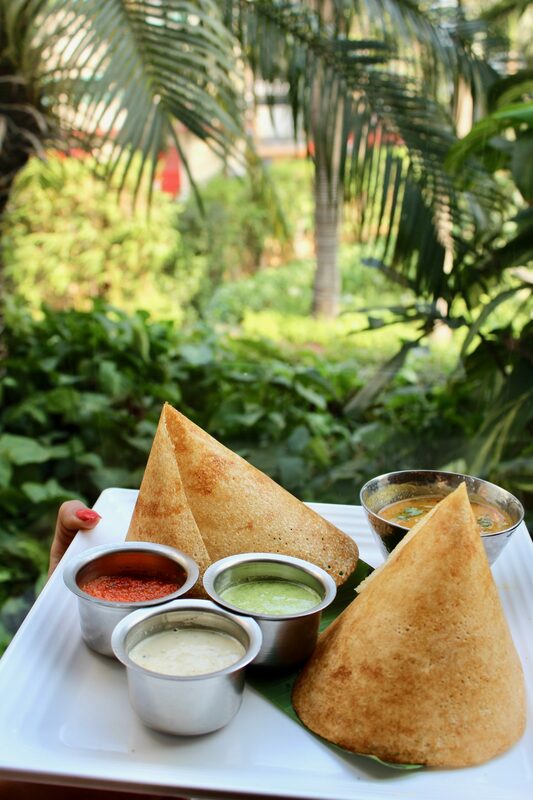 I absolutely loved the Podi Dosa which was layered with masala and gave an enriching taste. Also on offer were tempting hot Parathas. One day we had Aloo paratha while the other day was Gobi paratha. Both well made with generous filling! How can we be in Mumbai and not have Pav Bhaji, yes, we tried the Mumbaiya Pav Bhaji too! Idli was fresh, fluffy, soft and yummy! Other options included fresh fruits, Poha, Pav Bhaji, Upma, Tomato Rice, Hakka Noodles/Fried Rice, Milk, Cornflakes and bread. It was a treat for non-veg lovers as well with Chicken Salami, Smoked Salmon, Chicken Cold Platter, Chicken Sausage, Pork Sausage and Bacon. Everything was made well and the chefs took special care of every guest to ensure they are well fed and happy. 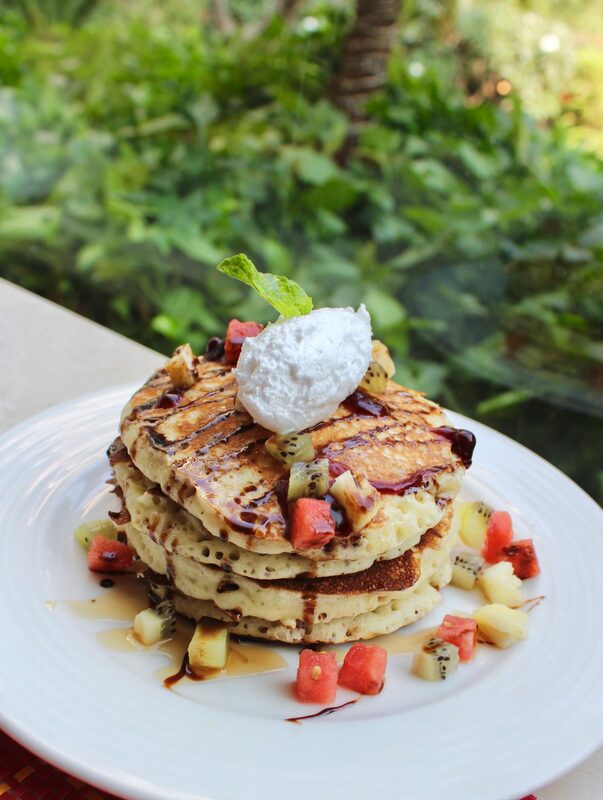 For our sweet tooth, there were freshly made Pancakes, Waffles and French toast on the live course while an assortment of muffins, donuts and cake. 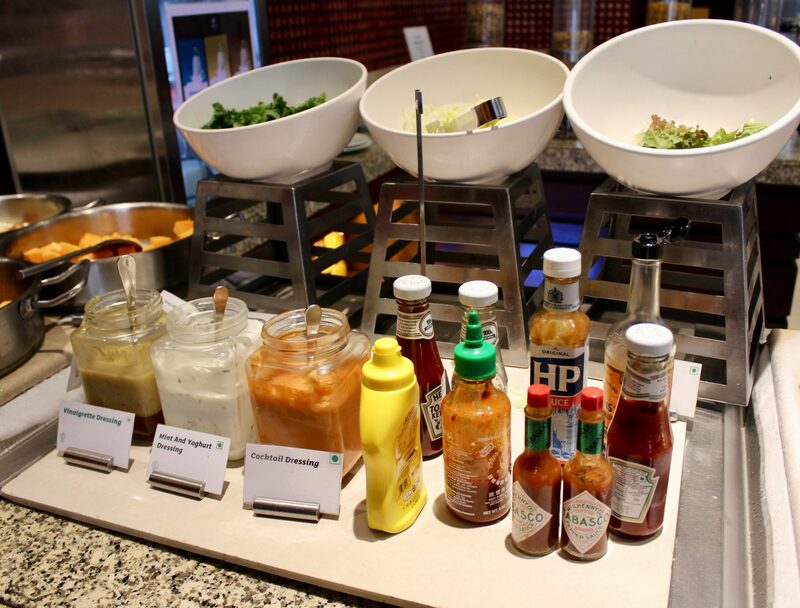 Salad lovers and fitness freaks could also make their own salad at the Salad Bar which also had a wide variety of dips presented in different glass canisters. It looked so beautiful that any of us would just be tempted to try them! 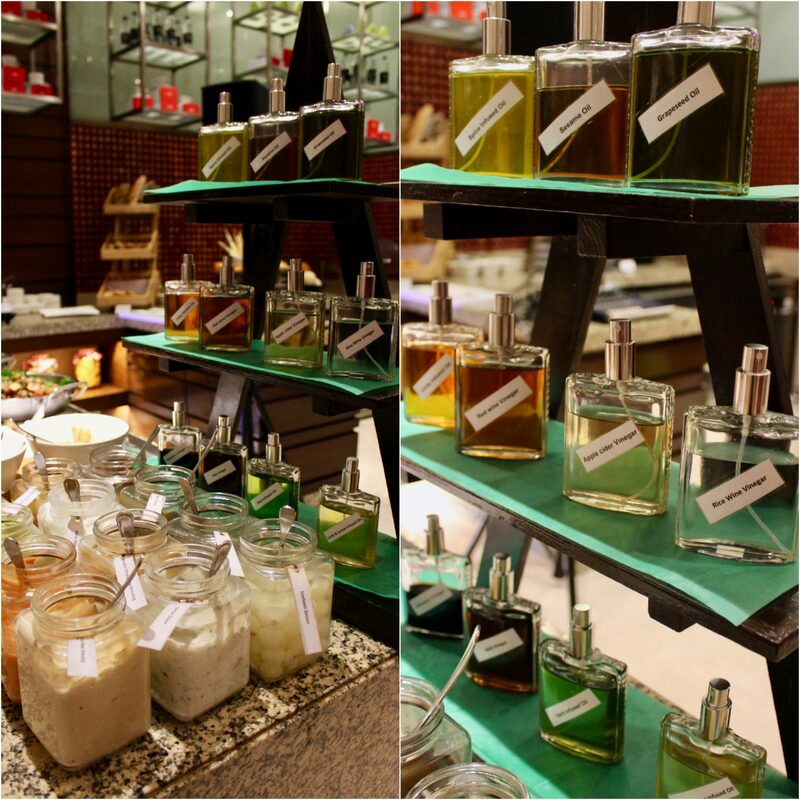 A special section was also dedicated to oils which were stocked in different perfume bottles. There were unique oils like Garlic and Lemon infused oil, Red Wine Vinegar and more- isn’t that so innovative! 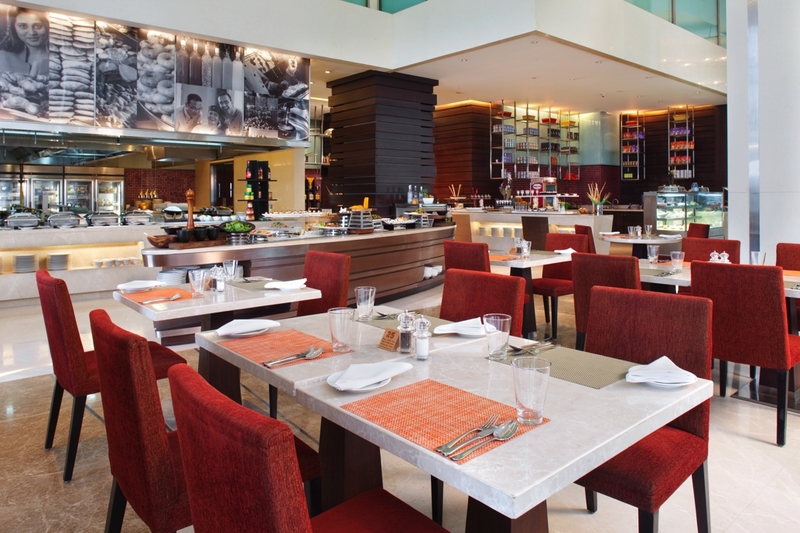 An advantage of weekend travel is the brunch and the Sunday Brunch is ritual at Holiday Inn Mumbai. 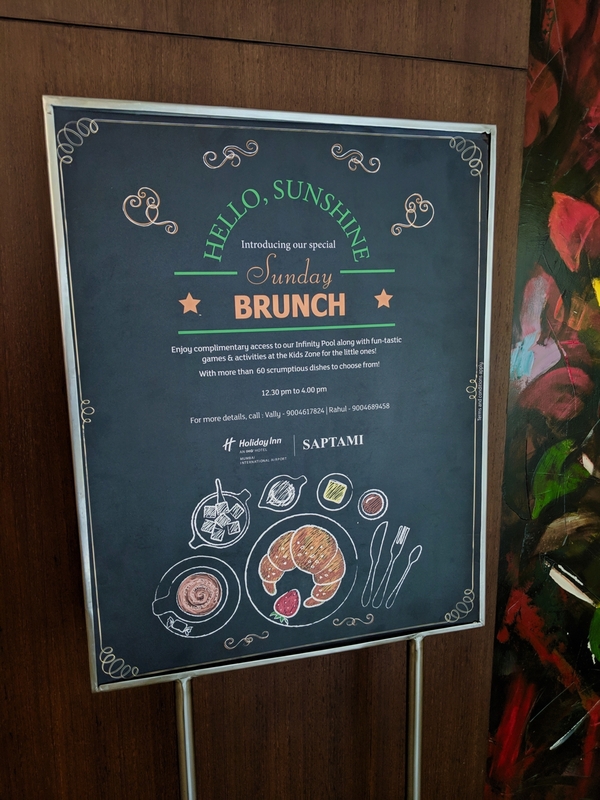 Hosted at Saptami restaurant, it attracts not only the hotel guests but also a lot of families who reside in the vicinity. 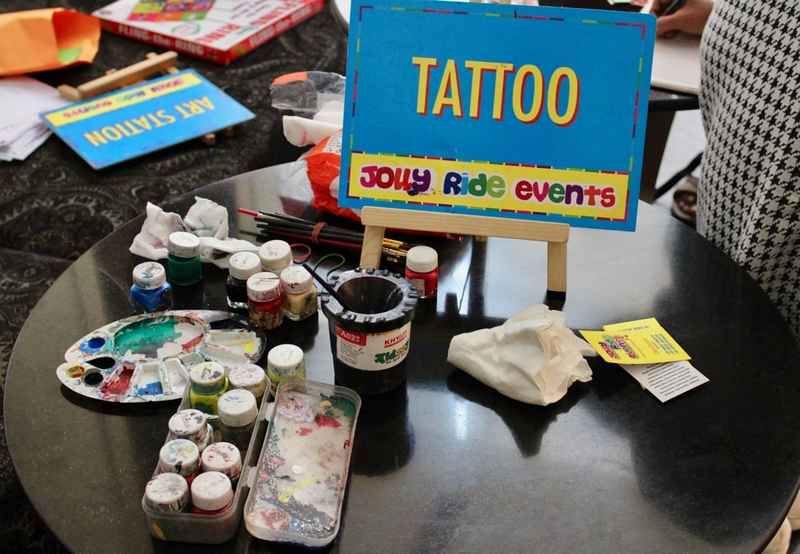 While entering we saw kids activities like Tattoo and Art n Craft. 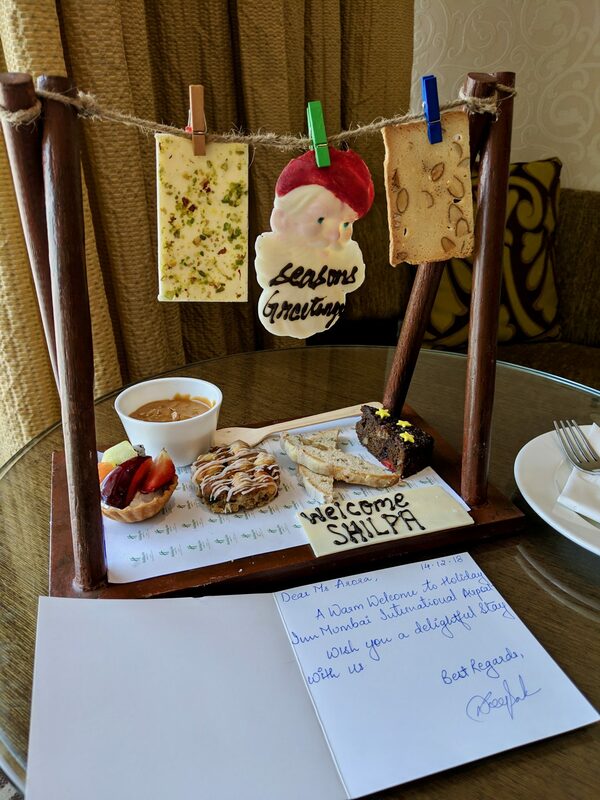 Loved the way the hotel takes care of the guests. With different themes of the brunch, the restaurant whips a different menu most of the times. The one we got to be a part was dedicated to North Indian flavours and we got to try Chole Bhature, Murgh Tikka, Palak Paneer, Dal Makhani, Arbi, Aloo Gobhi, Raita and much more. 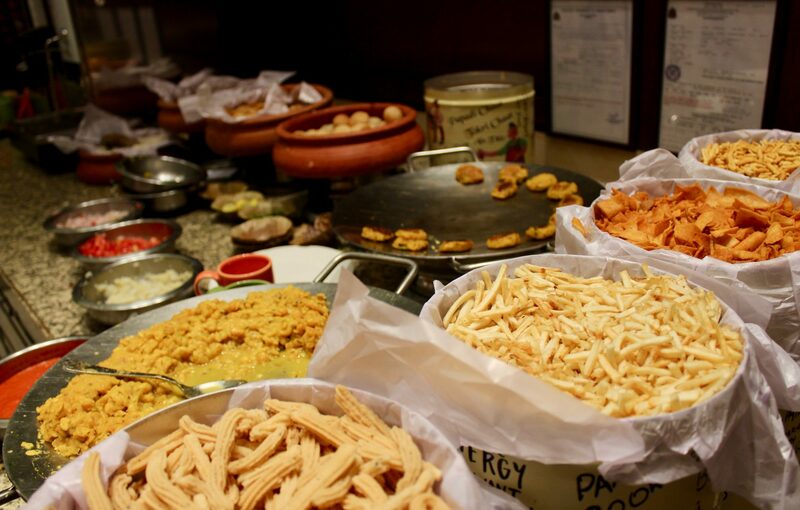 I loved the Street Food counter as well which had Pani Puri, Dahi Puri, Ragda Patties and other delicacies. 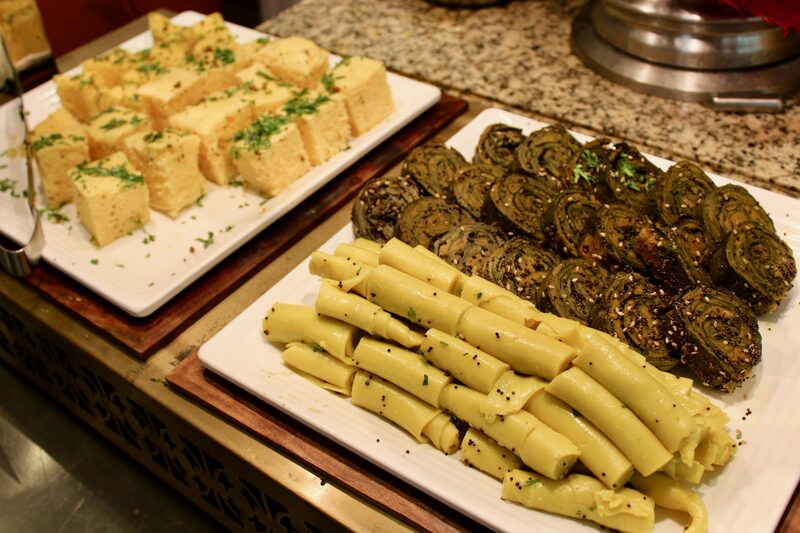 I could also spot my favourite Khandvi and Dhokla though it’s from Gujarat and not North but who cares when you get your favourites at one spot. There was also a Live Pasta counter and without a doubt one would customize it with red/white sauce and different varieties of pasta. 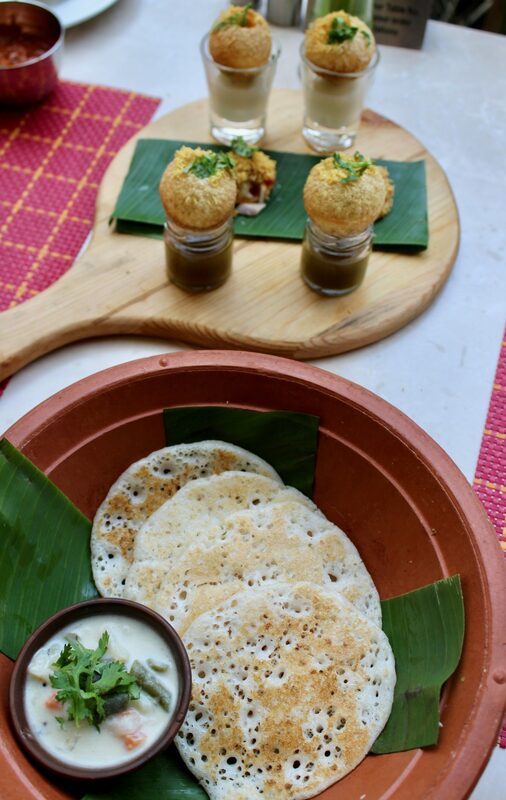 I liked the Sliders too served with fries which I am sure the kids would have loved too and not to forget the Appam served with Coconut Stew. So amazing and comforting! I ended the meal with a variety of desserts and Falooda Kulfi. As part of the Sunday brunch, there were also live singers who would go to every table and sing their favourite tracks or dedication. I could witness husbands dedicating songs to their wife or families enjoying the lovely time. Dinner was very well laid out and presented by one of the most hospitable team of the hotel. Different sections across the beautiful restaurant had yummy dishes and we were confused what to eat and what not. The Chef made it easy for us and got us some of our favourites presented in a nice manner. One thing that caught our eyes was the wide variety of pickles kept on one side. It was one of the widest assortment of pickets I have seen at a hotel. 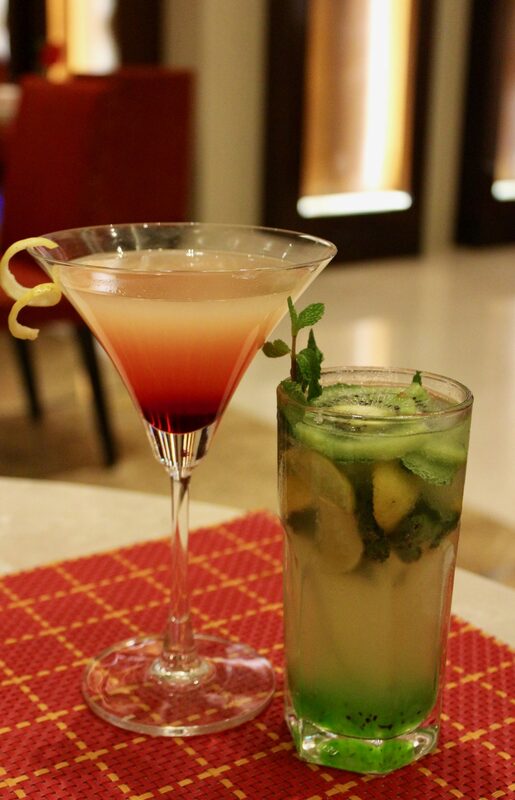 We started with mocktails- Lychee Pineapple Magix and Kiwi Mojito- True refreshers I must say! Next was the sea food platter which came with 4 types of fish – Basa which was a continental fish, Thai fish, Mandeli fish and King fish. 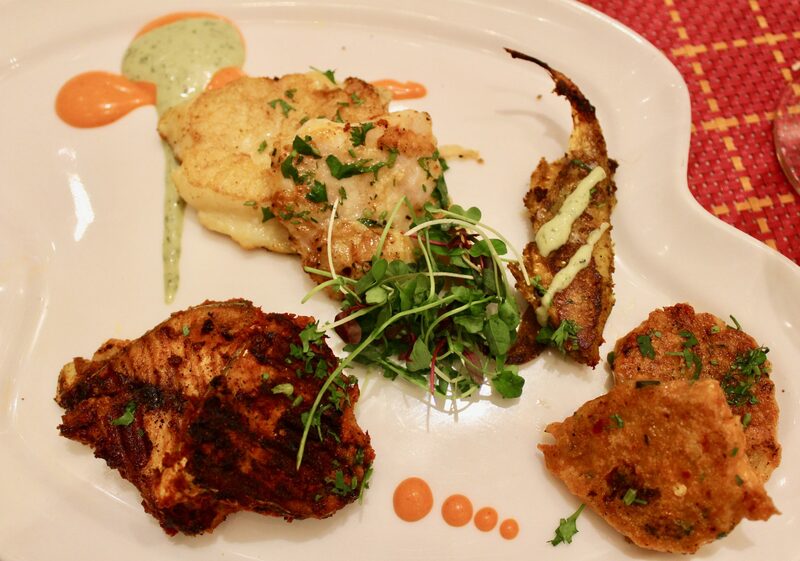 My favourite was the King Fish which was spicy with true Indian flavours. 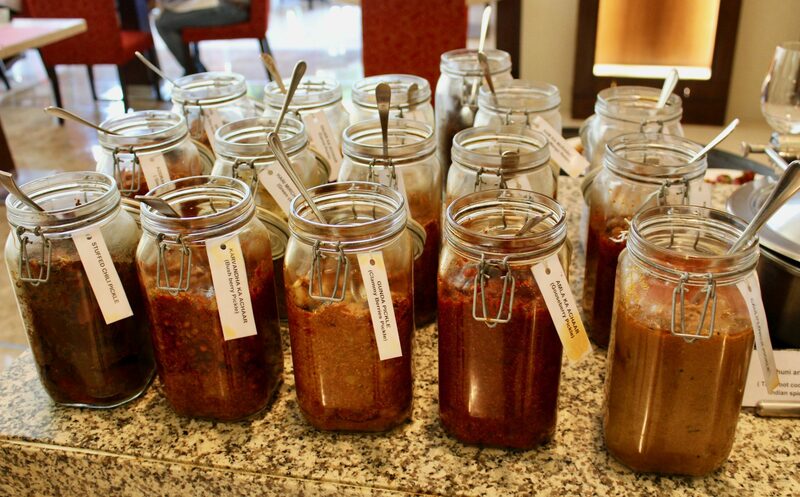 Afterall we Indians can’t live without our spices. Time for Pasta and from a huge choice of at the live counter we settled for Fusilli in Red sauce pasta. A great mix with nice and finely cut veggies added the nutrition as well as taste. Chicken Zafrani had true Indian flavours as well as taste. 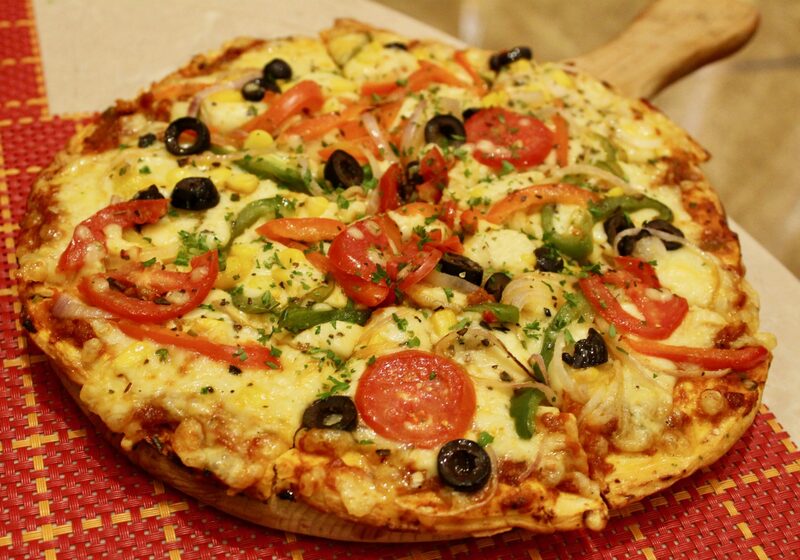 The Veg Pizza came topped with mozzarella cheese, onion, trio bell pepper, corn and black olives. Yummy it was! The Deep Fried Schezwan Vegetables were a mix of broccoli, carrot, baby corn and other veggies which tasted amazing. The Multani Paneer was soft and tender which was absolutely cherished by me and so were the Cajun Spiced Fish Fingers. There was also a live singer singing melodies songs making the ambience enriching and brighter. 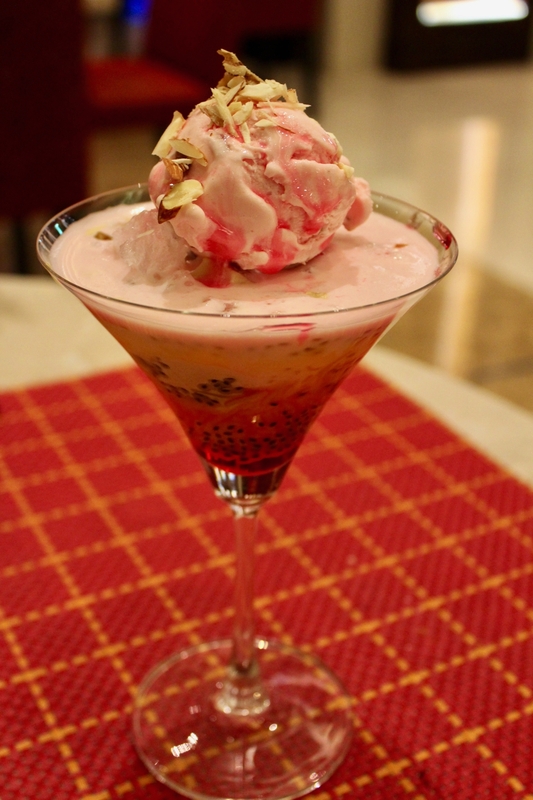 Last but not the least we had the dessert which I have had only in Mumbai – Strawberry Falooda Kulfi. Here it was an unusual presentation from what I had at the beach. This one was served in a glass and tasted amazing. 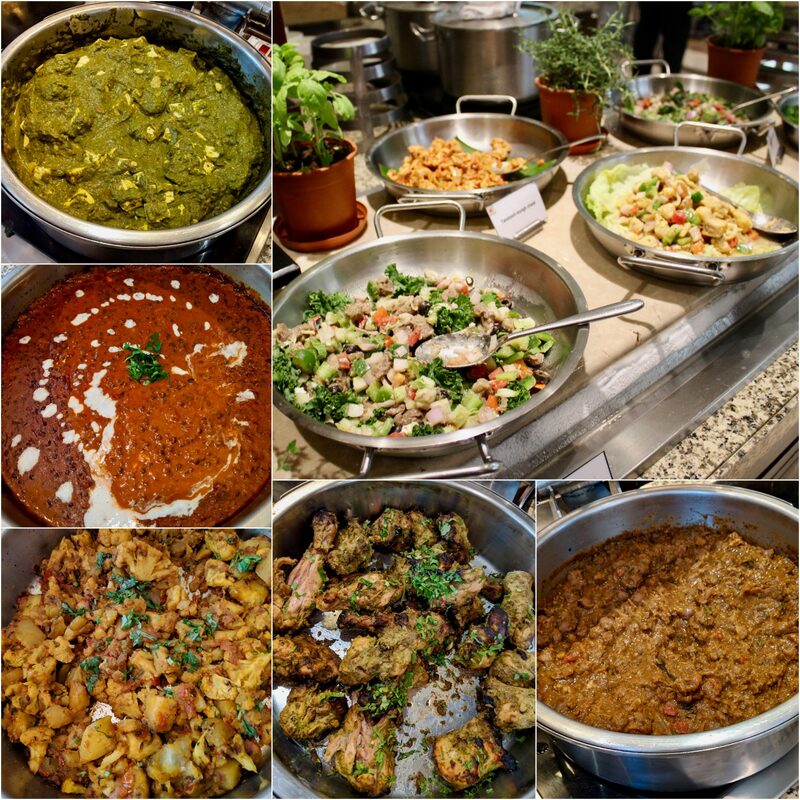 There was also a wide variety of Mughlai and North Indian delicacies Murg Makhani, Roasted Fish, Spicy Chicken, Baby Potato but we skipped those as we were too full. 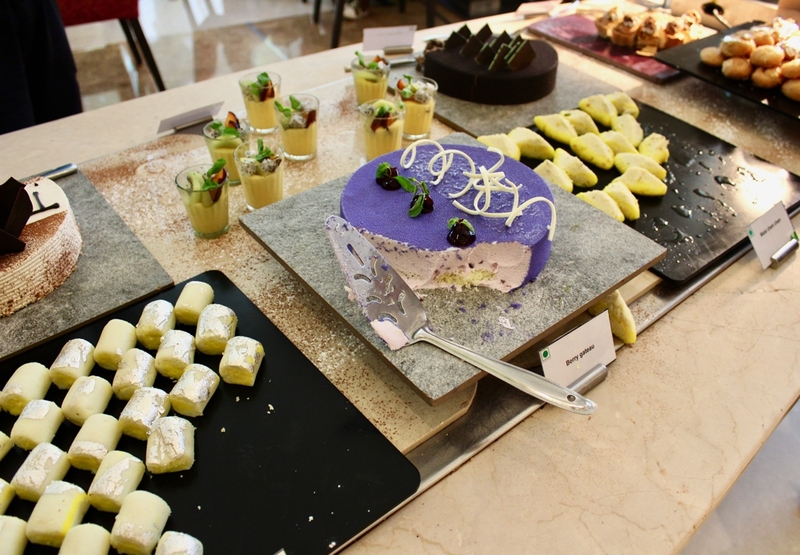 But one thing we could not miss were the colourful desserts which tasted great! 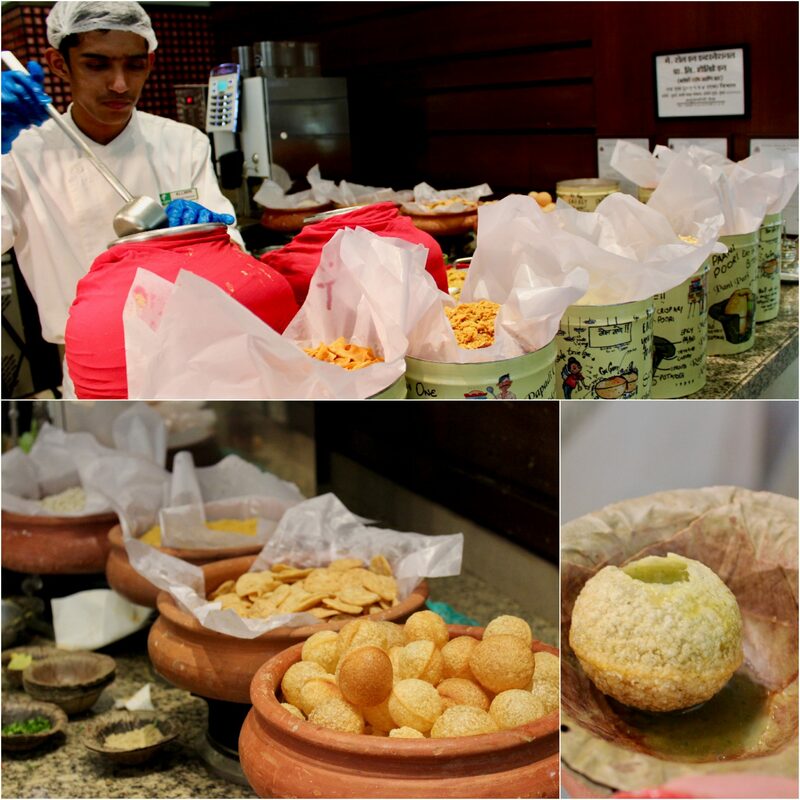 There was also a Street Food counter which had some amazing chaats and tikkis being made at the live counter. 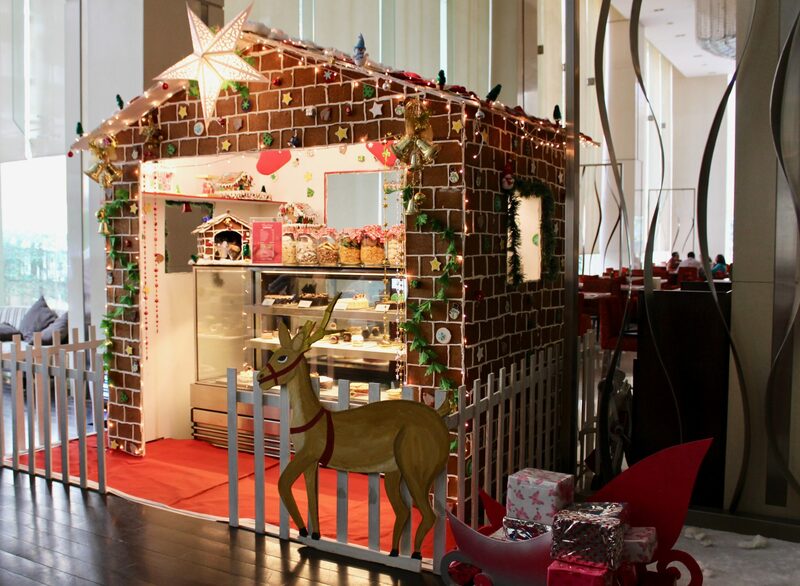 We spoke to the Chef who mentioned that they follow different themes on different days. While some days its barbeque, on other days its pizza, some days its khichdi while other days its Noodle bar! 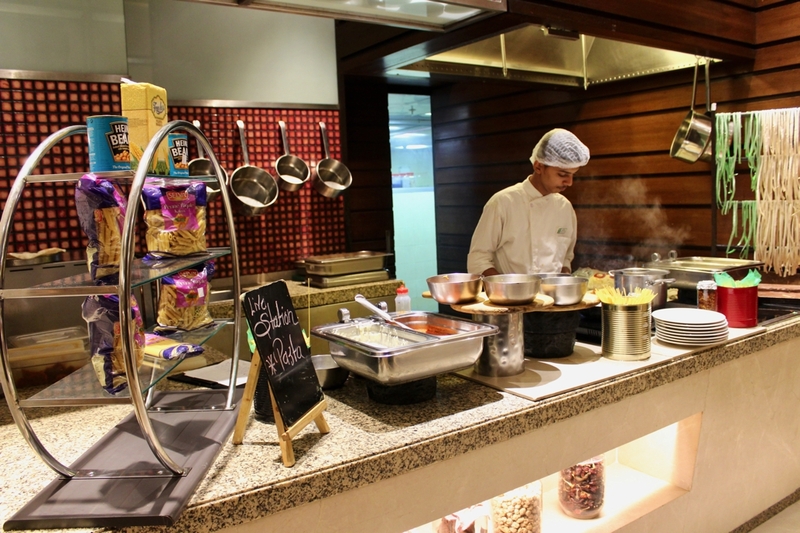 Pasta and Chaat counter is on all days. One thing that I liked here was that customizations are possible according to the guest’s preferences. 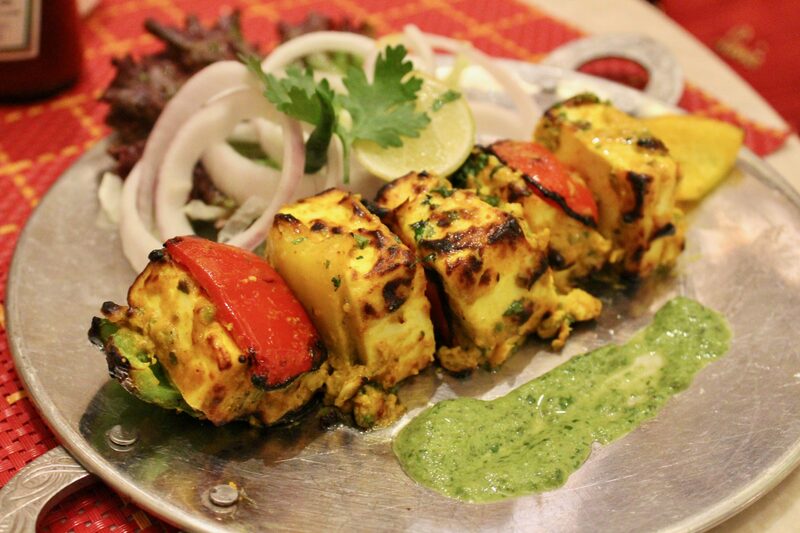 If someone wants less spicy or more spicy or a guest wants something special, then the chef does the best to fulfill the guests wishes. That’s the reason why guests stay here for as long as 2 years. Don’t believe us? We didn’t believe it too until we bumped into a guest from Singapore in the lift who has been staying at the hotel for the last 11 months. He was here for the ongoing Metro construction and was really happy with the staff. He had a packet of ready to cook packaged Singapore noodles in his hand which he handed over to the chef to make (wherever in the world we are, we would want to eat Apne desh ka khaana). Another thing that I really liked was the kind of attention given to everything. With a variety of breads they have like Chapatti, Naan, Paratha etc, they also have a lady who specially comes to cook Phulkas! 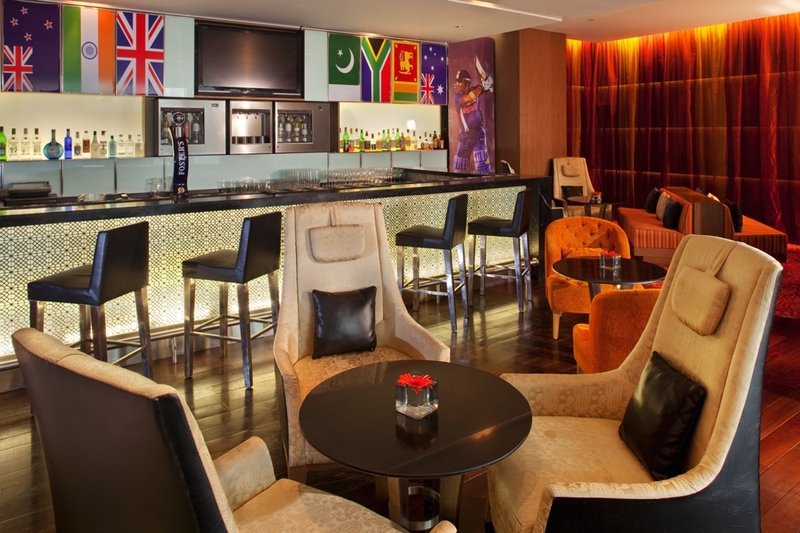 The hotel also has a bar as well as café which caters to the demands of the guests and customers. 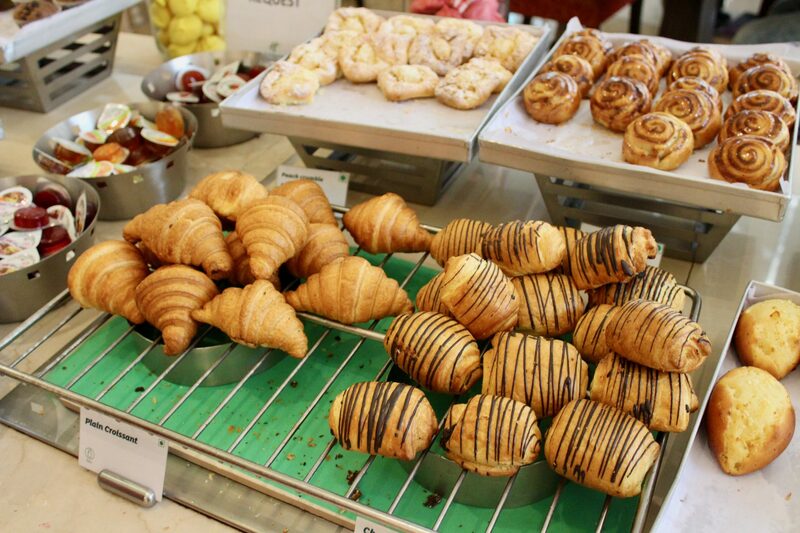 Saptami Express is a bakery and delicatessen that offers variety of fresh deli and will ensure that all the sinful cravings are fulfilled. 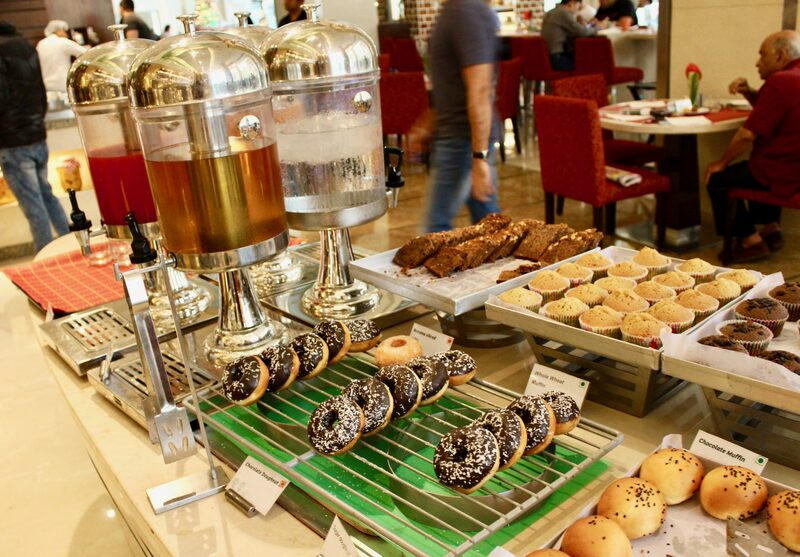 Located at the Lobby Level it is operational from 9 am to 11 pm. 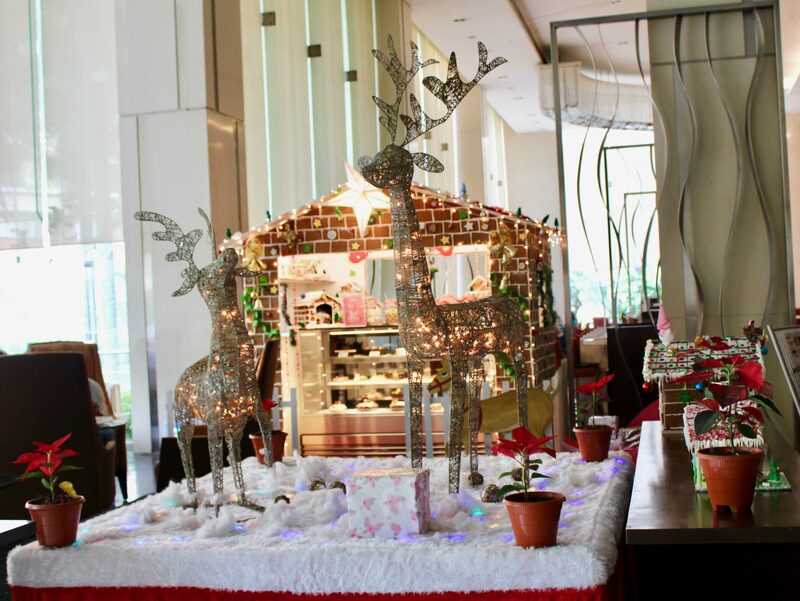 It was the month of December when we were at the hotel and the café was decked up in the Christmas theme and had a wide range of cakes, puddings and cookies on offer. 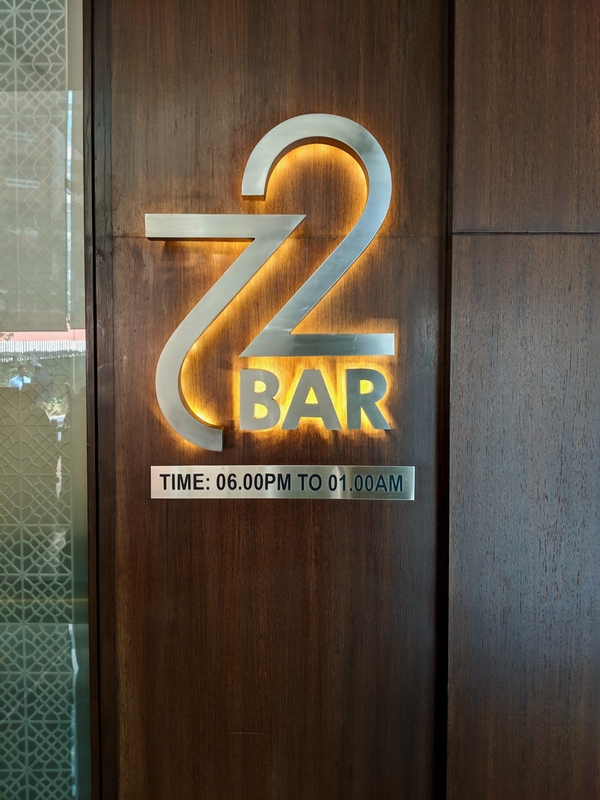 The bar named ‘72 Bar‘ opens from 6 PM to 1 AM and offers drinks as well as food. 72 is a stylish and elegant looking lounge bar being the perfect place to relax and unwind over premium malts, spirits and signature cocktails. 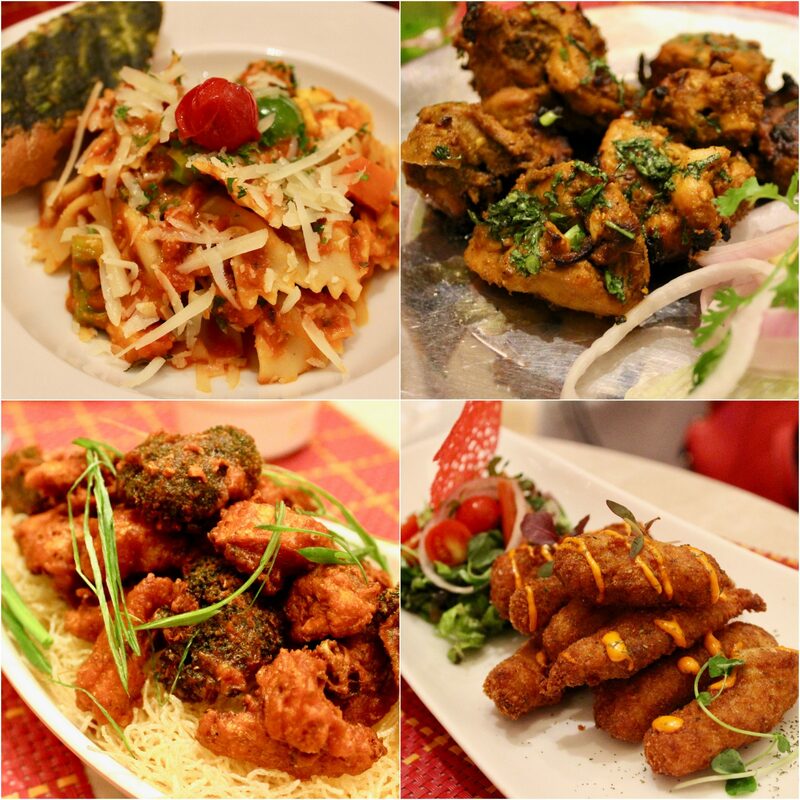 The exhaustive beverage menu is complimented with Chef’s delectable appetizers. The bar decked up in orange and purple looked really appealing with dim lighting setting up the mood. 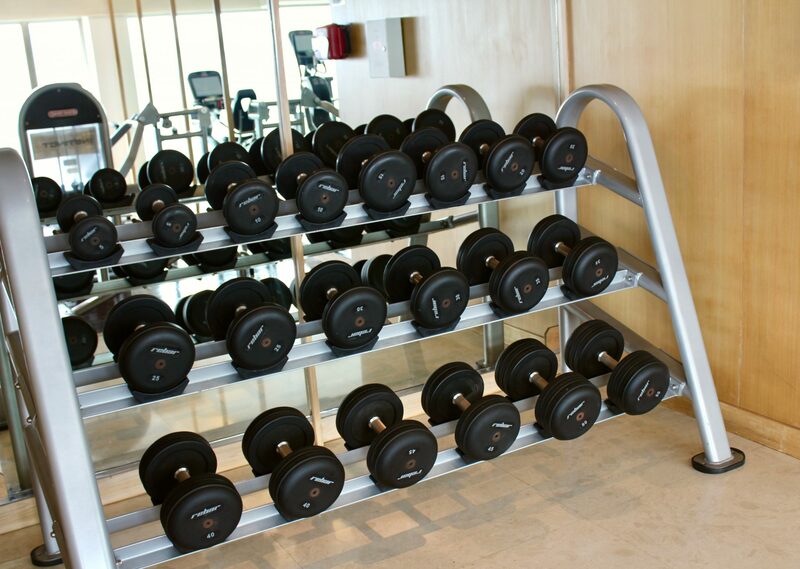 Other services of the hotel includes swimming pool for guests to enjoy, a fitness centre which is well equipped with all machines as well as weights. 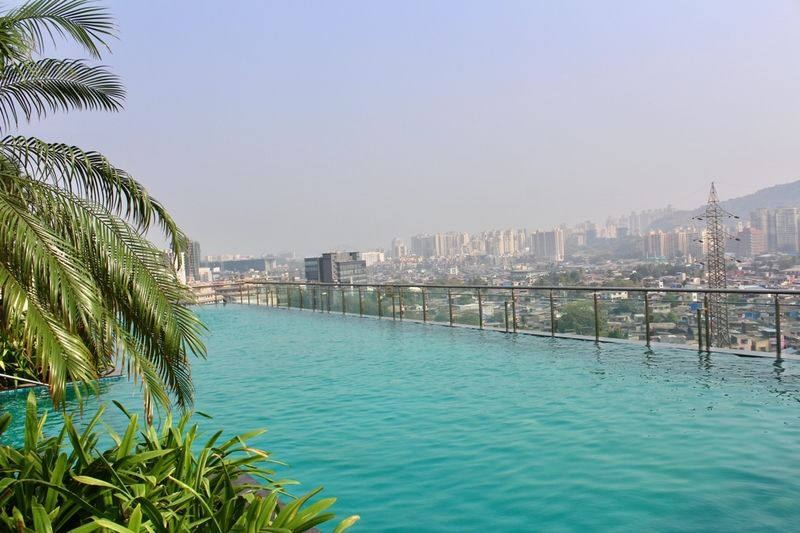 The Rooftop Infinity Swimming pool offers a wonderful view of the Mumbai skyline. Enjoy this endless expanse of blue to unwind under the sky. 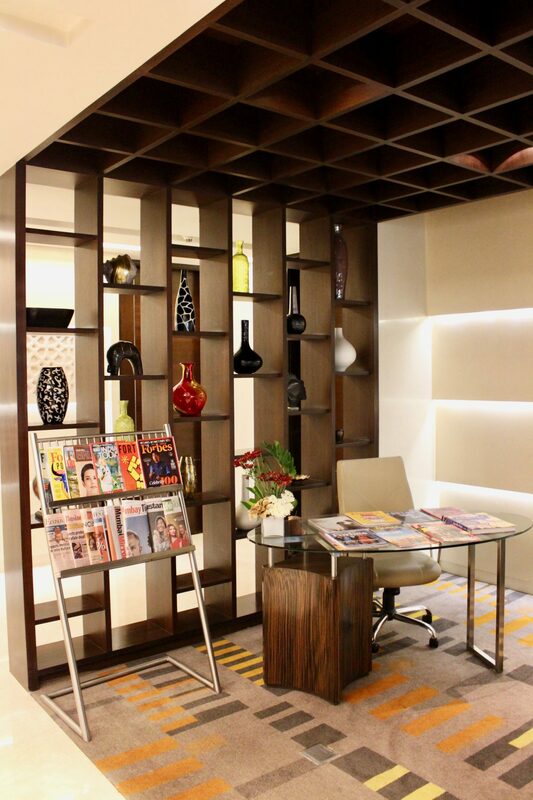 There is also an Executive Lounge which can be accessed by IHG members. 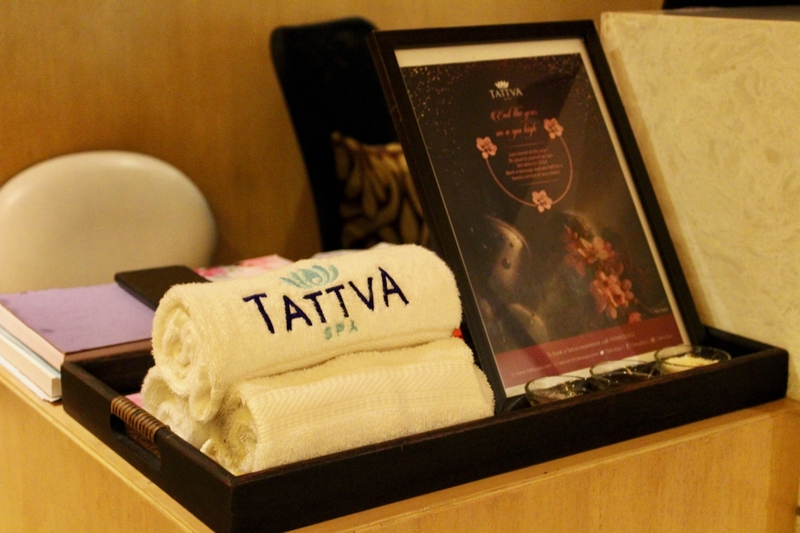 I also indulged in the fabulous Tattva Spa located on the 7th floor of the hotel which was a retreat in real sense. The last few months have been quite hectic for me and this was my time to rejuvenate. The catalogue boasted of an array of massages from Ladies Love to Couple Massage. I have always preferred light massages to relax myself and was recommended Swedish massage. 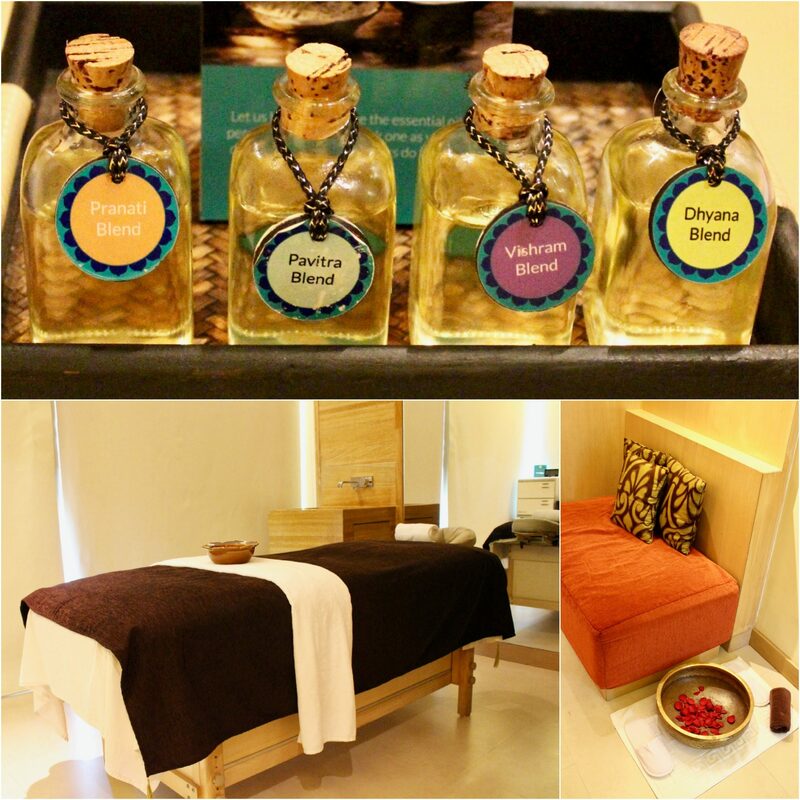 I was asked to choose amongst the 4 oils and I chose Pavitra blend which had a mild fragrance to enrich my body. 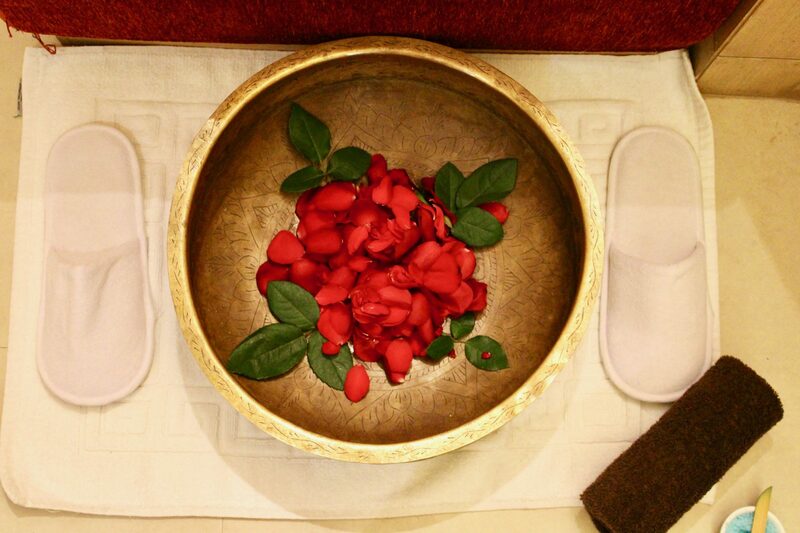 The masseuse did her job with perfection concentrating her energy on every body part of mine and without a doubt I was rejuvenated in true sense after the 60 minutes of heavenly time. The spa was followed by 10 minutes of steam and a shower. 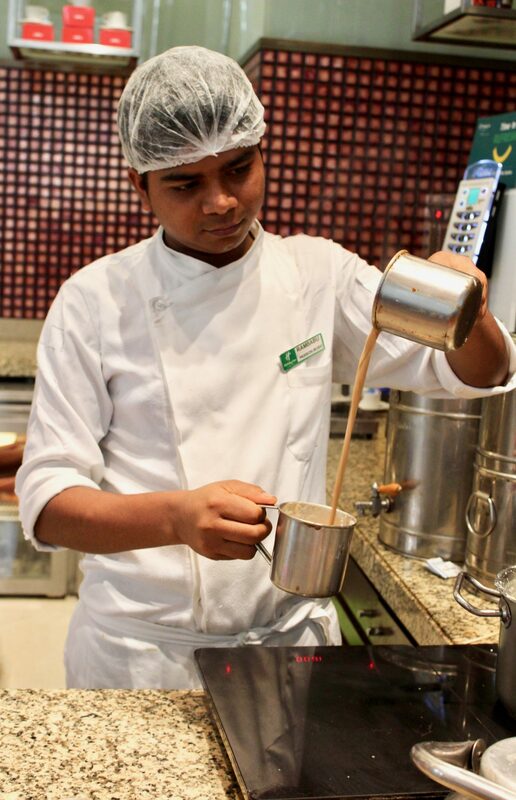 The hotel does not only take care of guests but even employees, I think that’s the reason why they are always smiling! You would have seen employees with formal attires and name badges at almost all luxury hotels but here there was a difference. 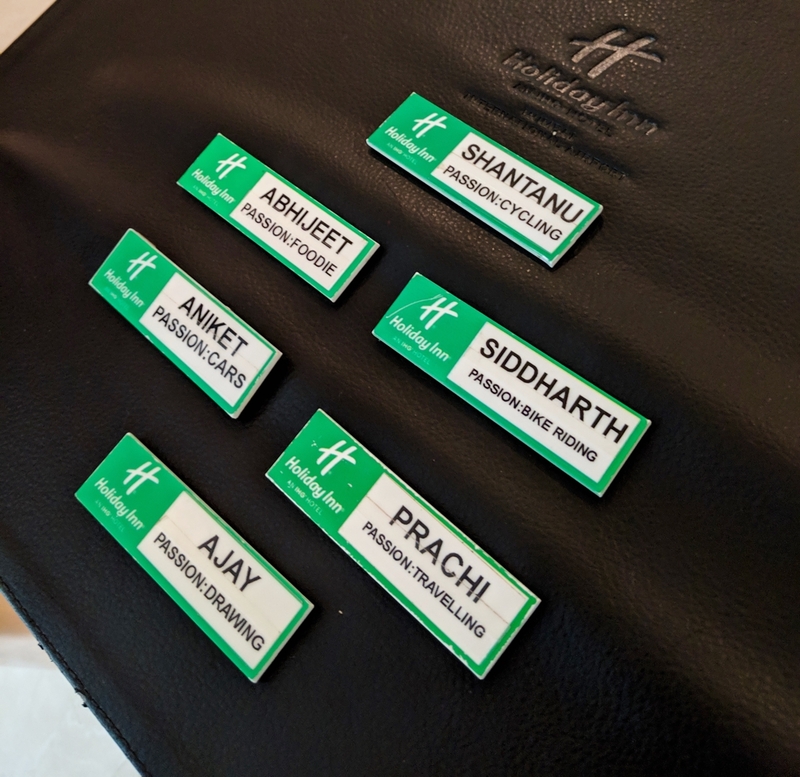 The name badge of the employees at Holiday Inn Mumbai also spoke about their passion. 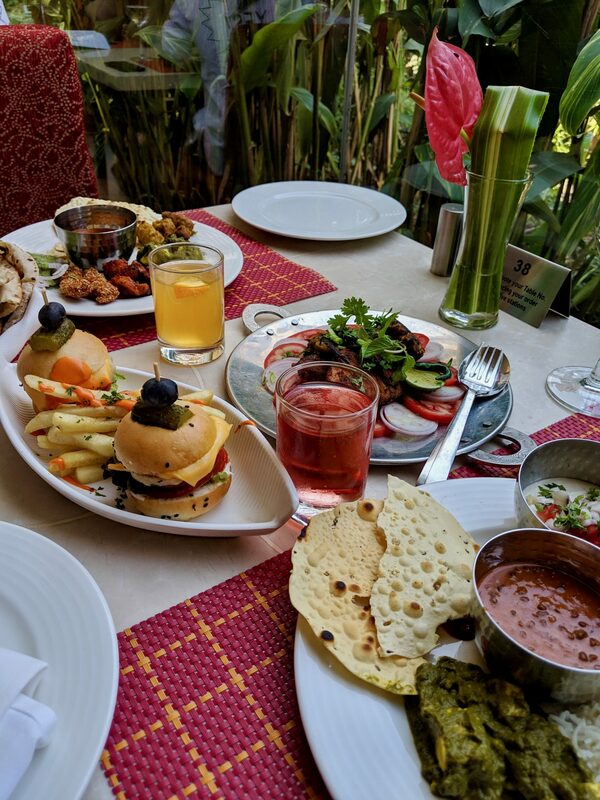 Whether one is a foodie or a traveller or an artist, the badge would boast about it and that’s what also lets you connect with the guest. 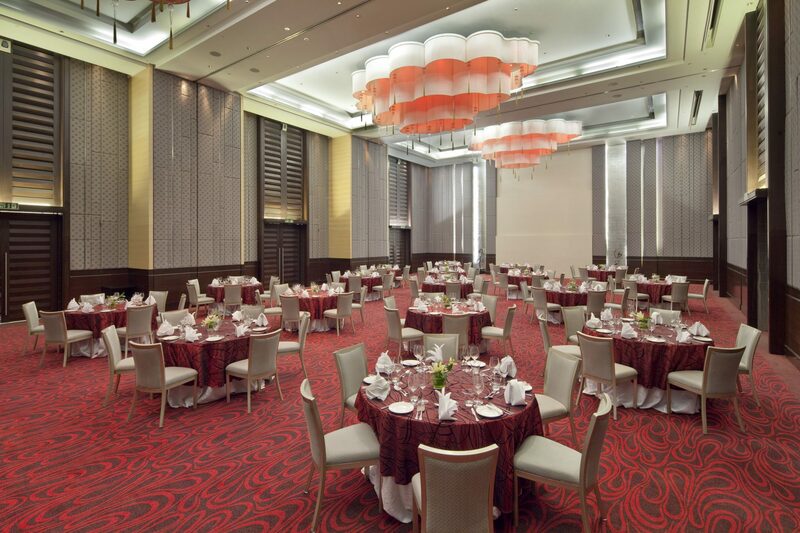 Another highlight of Holiday Inn Mumbai International Airport is their ballroom! Perfect for conferences, weddings, as well as pre and post wedding functions. With a capacity of 700 people, it is just perfect! Weddings are customized with state-of-the art amenities, a special wedding menu designed by their Celebrity Chef Pai and they also take care of any special requirement one would have for their D day. 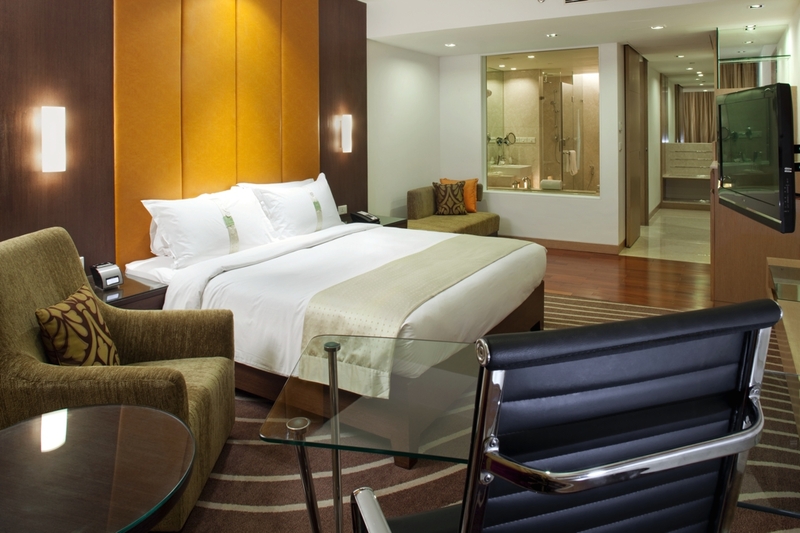 It’s just the perfect hotel if you are travelling for business or leisure. 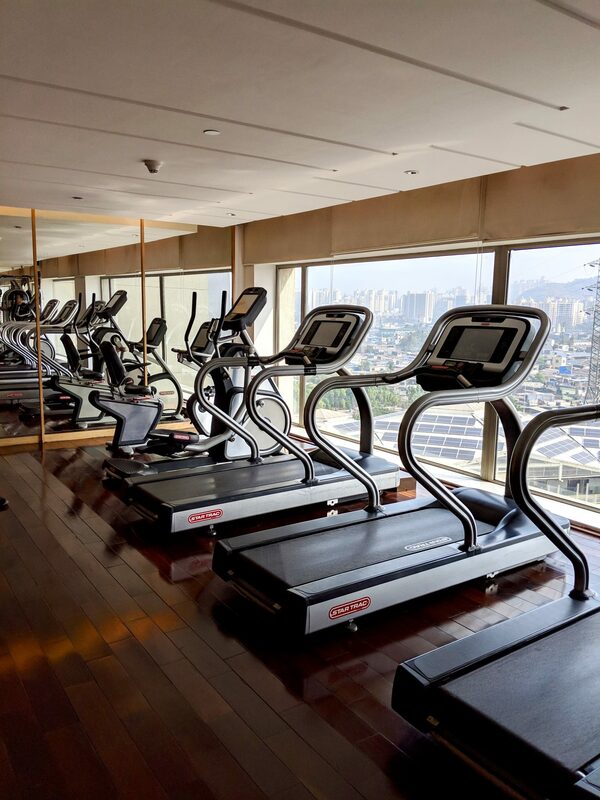 The hotel is close to businesses in commercial north Mumbai, with the famous Bandra Kurla Complex just 8km away. If you are here for a business trip, you can reach for meetings at the Accenture office well in time which is just 3.5km away, and WNS Global Services 6km away. If you are on a leisure trip like us, then you can visit the colonial grandeur of the iconic Gateway of India archway at Mumbai Harbour, where ferries leave for the hand-carved Elephanta Caves on Gharapuri Island. 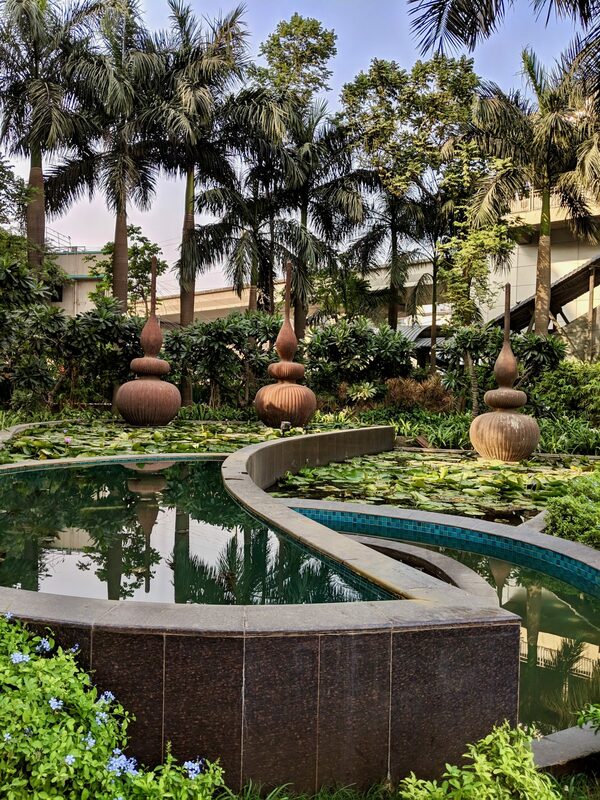 Both sights are around 25km from this hotel near Mumbai airport. We also made our visit to the Gateway of India and went on a Ferry Ride though skipped the caves! 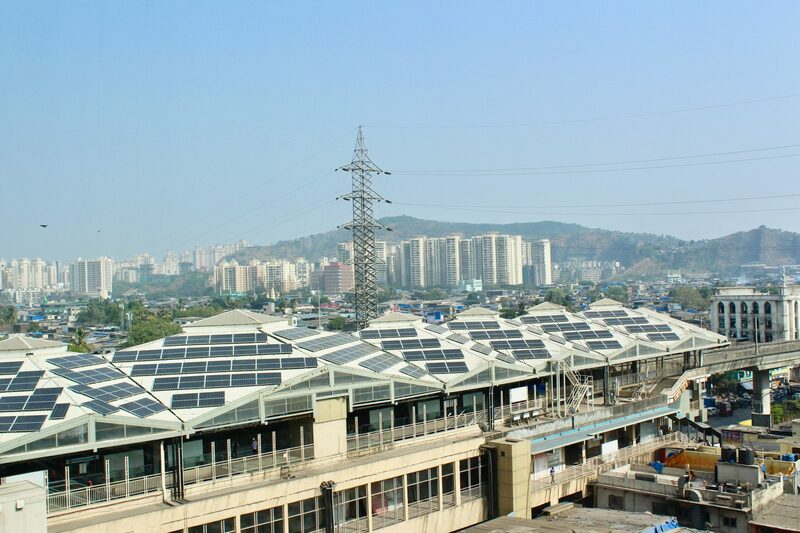 You could also pre book the dedicated hotel cars which will chauffeur you between the airport and the Chhatrapati Shivaji International Airport terminals.